Neptune, God of the Sea, is the ruler of Pisces. In astrology, Neptune is considered a planet of inspiration, dreams, psychic receptivity, illusion, and confusion. Neptune rules spirituality, and all things subtle. A youthful, and sometimes naive, spirit characterizes those with a strong placement of Neptune in their natal charts. On the up side, Neptune is associated with intuition and spiritual enlightenment. As well, it is a planet of mercy and compassion. The more negative manifestations of Neptune include deception, trickery, deceit, guilt, and addiction. In the chart, the position of Neptune by sign will be shared with other people in the same generation due to Neptune’s slow movement in the heavens. By house, Neptune’s position shows where intuition, dreams, and psychic sensitivity come into play. Natives may be able to rise above the demands of the ego in the areas of Neptune’s influence. Planets that Neptune contact are often colored by fantasy and dreaminess, and a vulnerable nature that may be susceptible to disillusionment. Here, we find hope that is sometimes unrealistic, a poetic and intuitive outlook, and compassion. Neptune, another of the outer planets, was discovered in 1846. Its slow orbit around our zodiac ensures that its effect is generational in nature. Neptune’s glyph is the trident of Poseidon, God of the Seas. Much about this planet is fluid (Neptune rules the oceans of the Earth), changeable and illusory in nature. Dreams, illusion, abstract thought and the mysterious are all governed by Neptune. Our spirituality is important to this planet, and how we harness that energy for our personal betterment. Neptune invites us to let its energy wash over us and to use a meditative state to gain insights and heightened awareness. Poetry, music and dance are among the trance-like activities which this planet favors. Neptune does have its showier side, as it rules movies, television, theater, fashion and all forms of glamour. In essence, Neptune is creating an illusion - of what is enchanting on the outside and captivating within. Neptune has a mystique which doesn’t reveal itself easily. It can be a poser, too, dabbling in flattery - and subversion. The shadow side of Neptune is akin to the aging star who cannot make one more curtain. When the lights are low, this planet plays in a netherworld of drugs, alcohol, trances and hypnosis. Neptunian energy reeks of escapism on its darker days, a sea of delusion, hypochondria and abnormality. Sleep and dreams are also lorded over by this planet. At the end of the day, Neptune keeps coming at you - how will you receive it? It takes Neptune 165 years to complete its whirl around the zodiac, spending roughly 14 years at each sign. It is feminine energy and rules Pisces and the Twelfth House. 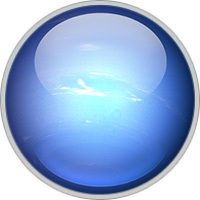 Neptune is known as the higher octave of Venus and is the second of the transcendental planets.